Revealing the dark art of oolong tea processing, a long kept secret known only to Chinese tea masters. The art of making oolong tea is little known outside China. Green tea is produced in over 30 countries, but oolong tea is produced in China and Taiwan, and only more recently in India, Nepal and Vietnam. Oolong tea can be machine or handmade. Premium grade oolong teas, such as the high grade Wuyi Rock tea and Anxi Tieguanyin, are always handmade. I don't think the Chinese intentionally want to keep it secret. As you scan through this page, you will learn that the traditional craftsmanship is too convoluted to master easily. Broadly speaking, there are 7 stages involved. Among them, the most important steps are leaf-selection or harvesting. It is followed by bruising and slow-baking. It is a stunning process. Enjoy the journey. Oolong tea leaves are picked 3 to 4 times a year in spring, summer (once or twice) and autumn. Autumn tea is also known as winter tea. It is made from more mature leaves consisting of one bud with 3 or 4 leaves. They are picked when buds at the top of bushes mature to half the size of a fully grown leaf. Quality varies with the season. Spring and autumn tea are higher quality than summer tea. Tender leaves picked earlier in the season may be used to make higher grade tea. The most exotic oolong tea - Champagne Oolong tea - uses younger leaves consisting of one-bud-and-two-leaf. The harvesting process is more akin to green and white tea than oolong tea. A popular picking technique is to face the hands upwards, hold the stem between the index and middle fingers, then break the stem gently using the thumb. Freshly picked leaves are left to cool either indoors or outdoors to remove moisture. This is important: the level of moisture determines how quickly tea polyphenols oxidise. The leaves may alternate between indoor and outdoor, as too much sun can cause over-heating. As moisture vaporises, fresh leaves soften and lose their natural springiness and lustre. But this is not a cause for concern. In the later stage (bruising), the leaves will regain their elasticity. The general principle is to go "from thin to thick". Initially the leaves are spread out thinly on a bamboo mat to prevent too much heat from accumulating inside the leaves. In the later stage, the leaves are spread out more thickly. The process also involves stirring, which distributes moisture evenly across the leaves and speeds up the oxidation process. This is perhaps the most critical part of the making process. For the Wuyi Rock tea, it can take up to 10 hours. It should be seen as a continuation of withering. The general principle is heavy bruising goes with light withering, and light bruising with heavy withering. It is during withering and bruising that most of oxidation takes place. The bruising process removes moisture and grassiness. During withering, leaves lose their suppleness. Amazingly, they are able to regain their elasticity towards the end of bruising. 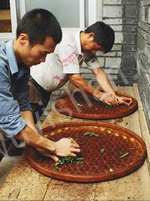 Tea-makers shake withered leaves in bamboo baskets and handpress them. The friction bruises edges, exposes tea juices to air and speeds up oxidation. The leaves are then spread out to slow down oxidation and other chemical changes. This shaking-resting process is then repeated several times. The length and intensity are adjusted to allow for variation in wind speed, light intensity, temperature and humidity on that particular day. Initial bruising is light, then becomes progressively heavier. In the later stage, the heavily bruised leaves experience a resurrection. Moisture travels from stems to leaves, causing them to regain their suppleness. The process ends when leaf edges start to redden and aroma substances form. At the precise time when aroma substances have started to form, bruised leaves are pan-fried at high heat to kill the enzymes and stop the oxidation process. This process is called fixation and lasts only a short time. The main purpose is to kill enzymes and stop oxidation. If it lasts too long, the leaves will lose too much moisture. Apply pressure to roll fixated leaves into the desired shape. Depending on the varieties, oolong tea can be either long and curly (Wuyi Rock tea), semi-rounded (Taiwan Dong Ding tea) or fully-rounded (Anxi Tieguanyin tea). The pressure causes leaves to secret juices. These juices interact and form new compounds. Some of these tea juices are absorbed back. Some are left behind on the outside and subsequently make tea quicker to brew. It is not a continuous process. After the tea has been rolled, it is heated in some way, then rolled again. There are two parts to this process. In the initial fast-baking process, high heat is applied for a short period of time. It removes moisture, stabilises chemical profile and freezes external shape. Low heat is applied for an extended period of time. For Wuyi Rock tea, it can last up to 7 hours. This is an important stage. The tea-maker decides how much "fire" goes into the tea. The additional slow-baking improves the color and aroma of the tea liquor. Wonder why oolong tea lasts for many more infusions than green tea? Slow baking makes oolong tea lasts longer. The type of fuels used can impact tea quality. Charcoal is the best, followed by wood, electricity, gas, oil and coal. During these final stages, leaves are sorted to remove sub standard leaves and twigs. It may be re-heated later, then cooled and packaged. Some teas are made "on the spot" in the mountain. These teas are then carried down the mountain for storage in tea-houses. Zheng Lisheng (2006). Wulong Cha Jianshang. Zhongguo Qinggongye Chubanshe. Photos are published with permission from Wuyi Town Government. The rigorous green tea harvesting process makes Chinese gourmet green tea the finest in the world. 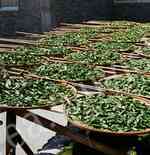 Chinese green tea processing uses 3 firing methods. We explore the advantages and disadvantages of each. White tea processing is fascinating. There is no heating and rolling. The tea-makers simply let nature takes its course.